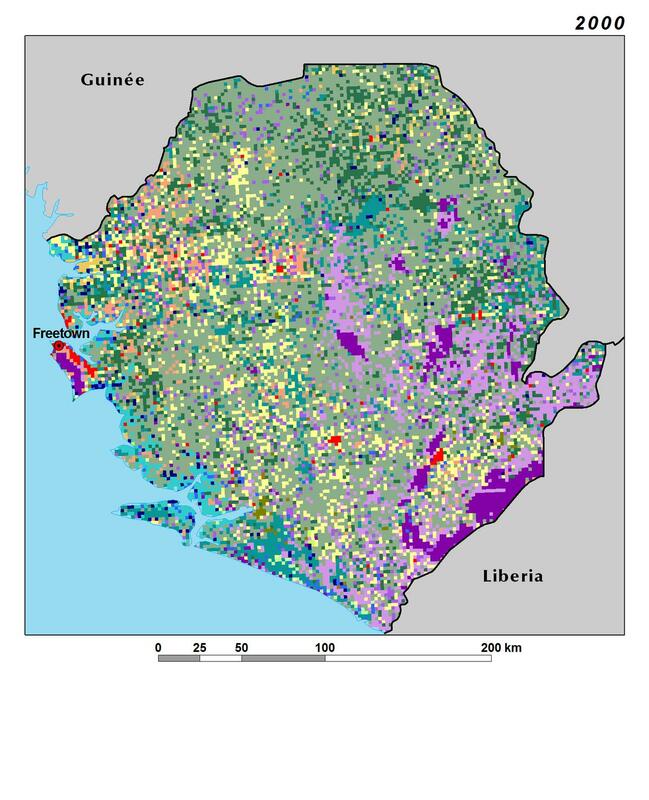 The most extensive land cover change in Sierra Leone was the loss of woodland and forested area across the country. Dense forest is rare and mainly found on hill slopes in the Montane Forest Zone. Even though the country is located within the Upper Guinean forest ecosystem, it is unlikely that it was ever heavily covered by dense forest (Munro and van der Horst, 2012). Between 1975 and 2013, Sierra Leone lost 30 percent of its forest cover, or about 1,100 sq km, at an average annual rate of 0.8 percent. However, this rate has slowed since the end of the civil war, averaging 0.4 percent of annual forest loss between 2000 and 2013. The main loss of forest occurred in the Tama-Tonkolili and Nimini Hills highlands. In 1975, these tracts of dense forest were located among a patchwork of degraded forest, gallery forest, and woodland — none of which has been spared by deforestation. Degraded forest decreased by 26 percent, or about 2,000 sq km, and gallery forest by 22 percent, or 700 sq km. 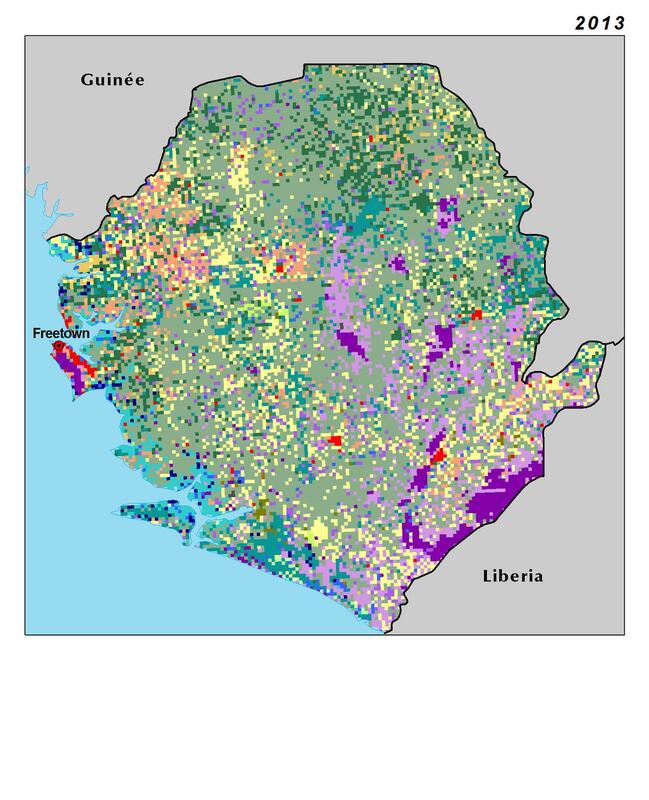 Woodland is one of the dominant land cover types in Sierra Leone. It is found in the major ecoregions— on slopes and uplands of the Koinadugu and Kono Plateaus, and on the Interior and Coastal Plains, among the savannas and thickets. In 1975, woodland was the second largest land cover class in terms of area after the savannas, covering 15.5 percent of the country. Over the 38-year period, its area decreased by 48 percent, or 5,400 sq km, shrinking to a mere 8 percent of the country in 2013. Accounting for all the forest classes together, Sierra Leone lost a total 36 percent of its forest and woodland habitats since 1975. Cropland expansion, slash-and-burn agriculture, logging, mining, and cattle grazing activities were the dominant factors affecting vegetation and land use. Indeed, resulting from an increasing demand for forest products and food production, half of the lost forest and woodland habitats were converted to savannas, and one-third to agriculture. Shifting agriculture has long been practiced in Sierra Leone. Under this system, a patch of forest is burned, cleared and cultivated usually for a short period of time (1–2 years), after which it is left fallow for several years. The rate of cropland expansion quadrupled after the end of the civil war, going from an average of 32 sq km per year in the 1975–2000 period to 130 sq km per year between 2000 and 2013. Overall, agricultural area progressed by 35 percent, or 2,400 sq km, between 1975 and 2013, mostly in the Interior Plains and in the northern part of the Koinadugu and Kono Plateaus. In Sierra Leone, where water is an abundant resource, bottomland and flood recessional agriculture is also very common. Many of the wetland areas mapped in 1975 have been converted to cultivated bottomland which has doubled in area, reaching 1,180 sq km by 2013. 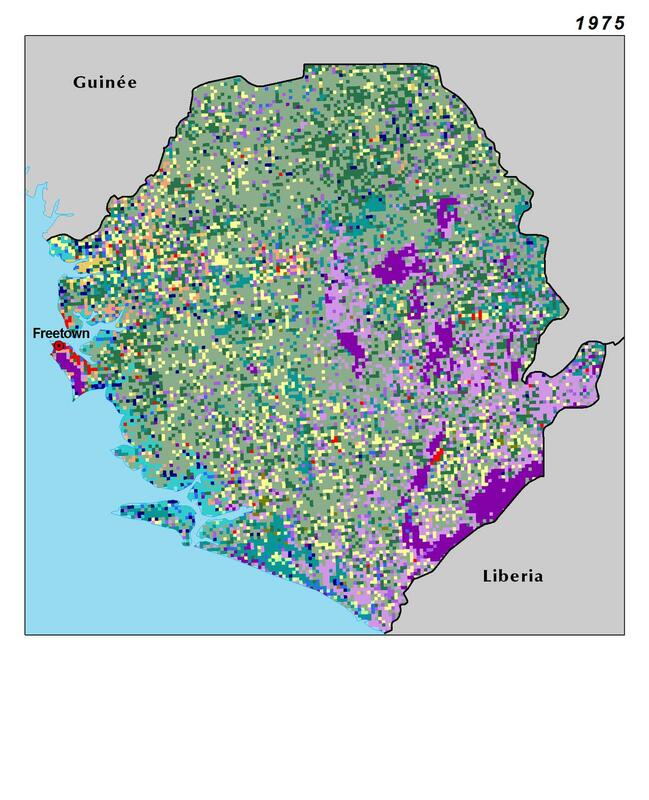 Because a large part of the population in Sierra Leone obtains its substance from farming, agriculture expansion was mostly driven by population growth. Whereas population increased steadily from 2.7 million to 6.1 million, a rise of 123 percent, the area occupied by settlements — towns and cities — only grew by 36 percent, or 140 sq km, from 1975 to 2013.